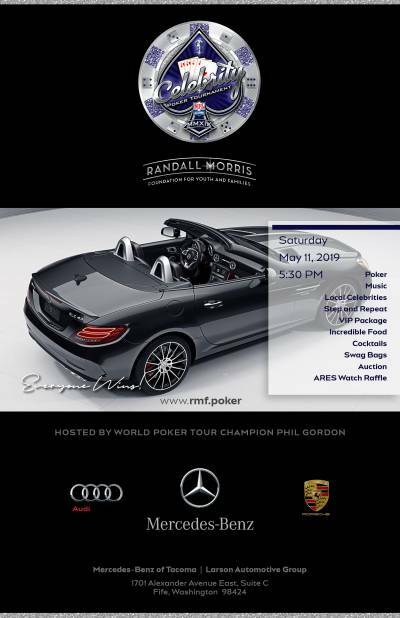 We Invite You to Join Us for the Second Annual Randall Morris Foundation Celebrity Poker Tournament and Casino Night hosted by World Poker Tour Champion Phil Gordon. You'll enjoy a night with bragging rights unlike any other as you compete against celebrities during the poker tournament or enjoy Blackjack, Roulette, Raffles, Silent Auction, a Pop Up experience by Nordstrom and entertainment that will keep you busy all night! We are updating our celebrity list every couple of days. Have a chance to meet them all as they rotate tables during the tournament. All ticket options include access to celebrities, tasty bites, and cocktails and more.